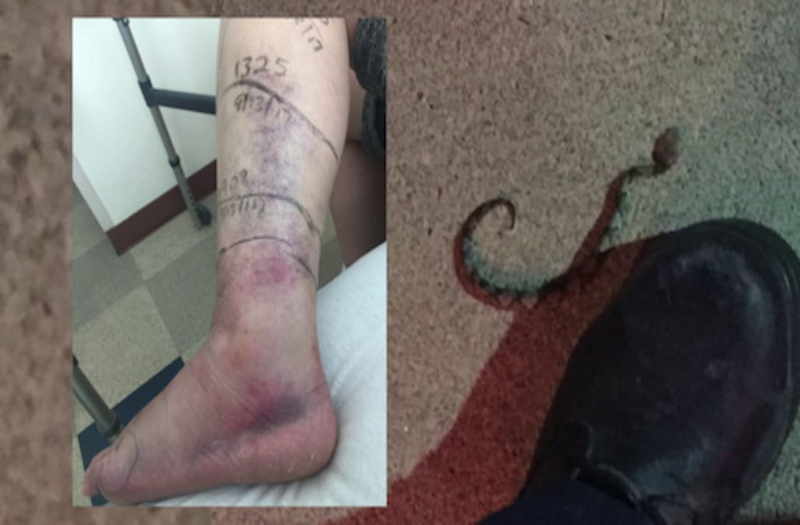 SPOTSYLVANIA COUNTY, Va. (WTVR) – A Virginia mother is recovering after being bitten by a copperhead snake while walking into a LongHorn Steakhouse in Spotsylvania County earlier this month. Rachel Myrick was with her 13-year-old son, her boyfriend Michael Clem, and friends and family during the September 12 incident. Myrick was in the restaurant’s foyer when the roughly 8-inch-long snake struck, biting her three times in the foot and toes. “I freaked out,” Myrick told The Free Lance-Star. The mother, who was wearing sandals, initially thought he had been stung by a bee, but she quickly realized the excruciating pain in her left foot was more serious. “I got bit! I got bit!” she recalled yelling. “There was no question what it was,” said Clem. It was a copperhead snake! Clem called the rescue squad as Myrick stood crying and screaming in disbelief. “They say that your life can change in a moment… and they’re absolutely correct,” she said about the sudden snake bite. LongHorn Steakhouse spokesperson Hunter Robinson told CBS 6 by email that as soon as the restaurant was made aware of the situation they also contacted 911 and assisted Myrick. “Our primary concern is for the wellbeing of Ms. Myrick and we want to provide any assistance we can,” Robinson wrote. Once paramedics arrived, Myrick was transported to Mary Washington Hospital. Myrick was released from the hospital on Sunday. The bites caused swelling that spread past her knee, and also some swelling on her hip and left thigh. Now in crutches, Myrick is facing a three-month recovery. “There’s very little that I can do. I can’t work. I can’t take my kids anywhere,” she said. As for how the copperhead got in the restaurant’s foyer, Robinson said they are still investigating. “This was a highly unusual incident, and we are working with our facilities team to see how this may have occurred and we are taking steps to prevent it from happening again,” said Robinson. Copperheads are one of three venomous snakes found in Virginia, but are the only species found in every county, according to the Virginia Herpetological Society. Wildlife experts said their bites are typically not fatal to humans but can be very painful. If you are bitten, you should get medical attention immediately.